In a comment on my previous blog post, Diarmuid Fogarty suggested, if ever I get tired of the A-Z format, I might simply go through the book titles on my bookshelves and write a blog post per book. As it happens, when Diarmuid wrote that, I was already planning to focus on a book that had been a key influence on my development as a teacher, a copy of which – second-hand but in mint condition – I’d recently managed to unearth, courtesy Amazon. 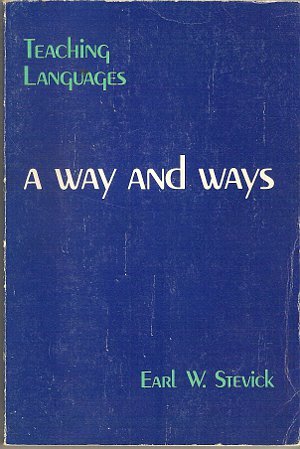 The book is Earl Stevick’s Teaching Languages: A Way and Ways, published by Newbury House in 1980. This was the first book on ELT I read of my own volition. (I’d of course read at least a couple of books on the intensive Diploma course I’d recently completed at IH London). 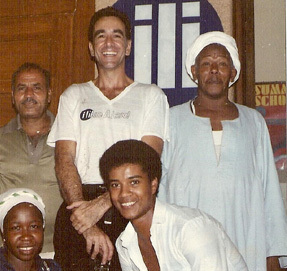 For some obscure reason, Stevick’s book was available in the bookshop of the International House affiliate I was in charge of, in Alexandria, Egypt, in the early eighties. I either borrowed it, or bought it for the school (I’ve never had a copy of my own until now). The book made a profound impression on me, at a stage of my development as a teacher and teacher educator (I was supervising a dozen newly-recruited teachers at the time) where I had already begun to question some of the ‘givens’ that underpinned my initial training five years earlier. For instance, I was no longer sure that a methodology of elicit-and-repeat would ever result in conversational fluency. Nor was I comfortable with a methodology that reduced learners to the role of passive consumers of ‘grammar mcnuggets’ . But I still hadn’t fully grasped the critical role that affect plays in learning – language learning not least. Learning, for me, was still a purely cognitive process. By opening my eyes to the emotional and attitudinal dimension of learning, under the umbrella of humanistic learning theory, Stevick’s book marked a milestone in my professional development. Early in the book, citing his own much-quoted dictum that “success depends less on materials, techniques, and linguistic analysis, and more on what goes on inside and between the people in the classroom,” Stevick adds that he has been able “to pursue this principle more deeply, and at the same time to practice it more broadly, than before”. As a result, he continues, “I have begun to suspect that the most important aspect of ‘what goes on’ is the presence or absence of harmony — it is the parts working with, or against, one another. How such a thing may happen within and between the people in a language course is the subject of this book” (p.5). In successive chapters, he describes his own quest for harmony in teaching, recounting how he had experienced, both as a student and as a teacher, such humanistic methods as The Silent Way, Community Language Learning, and Suggestopedia. For me, the realisation that success is more likely when the learner “is learning as a whole person, with body, mind, and emotions in harmony with one another” (p. 11) precipitated a major restructuring of my self-image as a teacher. There were 17 resolutions in all, and I still have the original typewritten document, which, photocopied and distributed to my teachers, became a focus for discussion at our regular meetings. Our communal attempts to realise these ideals formed the platform on which all my later thinking about teaching was constructed. I have read a lot of books on ELT since then, but none has had anything like such a profound impact, not just on my thinking, but on my actual classroom practice. This post is my tribute to its author: Earl Stevick – a great scholar, humanist and guide. And (because it’s customary to end on a question): Do you have a ‘book that changed your life’? I would have to say – Lionel Billow’s classic : The Techniques of Language Teaching Longman, 1961 re-published 2005 – see below. NB the part on Lionel’s book begins a few lines into where one lands. Thanks, Scott, I really enjoyed reading this. Your Uncovering Grammar was a pivotal book for me. I have heard others say it put into words what they’d intuited but not been able to articulate. I might add Interaction in the Language Curriculum: Awareness, Autonomy, and Authenticity by Leo van Lier as a book that got my juices flowing. Thanks, Rob. Curiously, I good friend asked me, just a day or two ago, if I’d do him a short reading list of key texts as a kind of DIY MA course, and, of the six books I listed, van Lier’s was one, as was Hoey’s Lexical Priming (mentioned by Mark below). One book that really changed my teaching was The English Verb by Michael Lewis. At the time, it was a revelation: shockingly simple and teachable guidelines for thinking about why and how verb tenses work. VanPatten, B. & Williams, J. (eds.) 2007. Theories In Second Language Acquisition: an introduction. Routledge. Block, D. 2003. The Social Turn In Second Language Acquisition. Edinburgh University Press. Gieve, S. & Miller, I. (eds) 2006. Understanding the Language Classroom. Palgrave Macmillan. van Lier, L. (1996). Interaction in the Language Curriculum: Awareness, autonomy and authenticity. Harlow: Longman. Kumaravadivelu, B. .2006. Understanding Language Teaching: From Method to Postmethod. Mahwah, NJ: Lawrence Erlbaum. Hoey, M. 2005. Lexical Priming: A new theory of words and language. London: Routledge. Larsen-Freeman, D. and Cameron, L. (2008) Complex Systems and Applied Linguistics, Oxford: Oxford University Press. Good stuff Scott. Reading the Billows extracts makes me wonder why ELT subsequently seemed to lose sight of his common sense ideas, making him sound years ahead of his time. Hoey’s Lexical Priming has radically simplified, and clarified, my understanding of the way languages are acquired, thereby transforming my two bilingual daughters into long-term action research projects, poor things. Keith Folse’s ‘Vocabulary Myths’ changed my teaching forever, not surprisingly given that I’d read almost all of the articles he cited in the book and had chosen to ignore most of them (sometimes we all need to be presented with something on a plate). This is a wonderful read and well recommended to anyone serious about teaching vocab. Thanks for that tip, Adam. To my shame I hadn’t heard of that, but I’ve found it on Amazon and ordered it! The clash between TEFL and teaching of English Literature has reached ridiculous levels in my country – India. The Eng-Lit teachers think of their counterparts in TEFL to be ‘mechanistic’ to which the TEFL guys respond saying ‘airy nothings’. The point you made when you said “…what goes on inside and between the people…” seems to be lost in this melee. The passion that drives the teacher is stonewalled by the prescriptive texts and meaningless writing tests that follow. Learning of language remains a threat for the kids. I have tried to salvage the situation by introducing research mode teaching of the prescribed texts and thus highlighting sts’ contribution to the process. Am happy with my sts’ progress, but yet to get peer response. My sts are 16 to 18 yrs old and have around 4-6 yrs of English. I’d welcome comments. Thanks for the great way you have put your ideas across. This sounds pretty dire. Are you saying that the texts used to teach EFL are primarily literary? I have to admit I’m not familiar with the situation in India. I didn’t know ‘A way and ways’ but I can heartily recommend another Earl Stevick book – “Success with Foreign Languages: seven who achieved it and what worked for them”. A rare case of a methodology book in which the learner’s voice speaks throughout, rather than the teacher’s. I also ought to mention that A Way and Ways was re-issued recently, completely re-written by Stevick under the title Working with Teaching Methods: What’s at Stake? (Heinle and Heinle). Out of purely sentimental reasons, I opted for the original 1980 version. A book that had a big impact on my teaching was The Mind’s Eye. Using pictures creatively in language learning by Alan Maley, Alan Duff and Françoise Grellet (also published in 1980 by CUP, although I didn’t get my hands on it until 1991). Apart from anything else it looked more interesting than most methodology books at the time, with that René Magritte ‘sky in the eye’ painting – Le Faux Miroir – on the cover. I was teaching an advanced level course at the time and was desperate for visual material that could truly engage my students. One day, The Mind’s Eye arrived in the school library. I thought here, for the first time, was a book with genuinely arresting photos, many of which I later found out had been taken by the authors themselves. The carefully thought-out discussion questions based around these images always allowed for open-ended answers and multiple interpretations. In fact, it was the first book I found that asked us to interpret and not merely describe images, to ‘look beyond the frame’ as it were. The contrast with the lifeless images found in the coursebooks at the time was quite amazing. It’s interesting that thirty years later the images we take ourselves (the new ELTpics group on Flickr is a good example) can ofen resonate far more than the often artificial images found in many online image banks. Zoltan Dörnyei’s book ‘Motivational Strategies in the ELT classroom’ represented a key shift in my thinking towards teaching teenagers. It’s one of the few books I have lost and bought again, and I use it a lot in training workshops for its simplicity & success at generating ideas and activities that take into account the affective aspect of learning. ‘Teaching Unplugged’ – Luke Meddings and Scott Thornbury. It’s the latest gem in my opinion. Full of wit and wisdom. Highly recommended! BTW: Scott, thanks for the recommended reading list – very much appreciated (you really do people like me a favour with your suggestions). I’ve only read one – the wonderful Mr Hoey – from it. Ah… so much to discover! In the end I just copied A History of English Language Teaching and went for Memory, Meaning and Method. Do you think that is right?? Thanks, Alex. Yes, I think you’re right about Memory, Meaning & Method (as being the Stevick book that has had the most influence). Certainly, for me it was where I first encountered the notion of cognitive depth as being crucial in vocabulary acquisition. It was also the first book written for language teachers that engaged with the subject of memory, and I drew on it extensively when I wrote How to Teach Vocabulary. To do this I had to get the second edition (1996), not having ever owned the first, and I was pleased to see that Stevick retained the section at the back called: What I hope for in the classroom, where he reduces to just six points the qualities of good teaching. As a list, it hasn’t been bettered. I suppose that the book which most influenced me in terms of my approach to teaching was “Challenge and Change in Language Teaching”, edited by Jane and Dave Willis. I read it during my DELTA in the late nineties and it literally changed the direction of my course. It made me re-think the whole issue of a traditional PPP lesson (Skehan´s direct and uncompromising anti-PPP article was exciting to read). I reconsidered learners’ & teachers’ roles and I actually think it was the first time I’d read about TBL. The book title couldn´t have been a better one! Needless to say, my last DELTA assignments (including the externally observed lesson) were spiced up by what I’d read. But more importantly, the book left it’s mark on my career – I would never see the ELT classroom in the same light again. It made me want to experiment, break boundries and take risks – it was as if I no longer needed the shackles of a ppp lesson! (very dramatic, but of course there is an intensity early on in our careers which is so very exciting….). And today as a teacher trainer I find that this book is still relevant! I also find it´s organisation excellent – a very easy read. It´s apparently out of print now. Shame. Thanks for your post and other colleagues’ comments about the books which influenced them. I’m going to chase after a couple of books I haven´t read yet. Hi Valeria. Yes, Challenge and Change was (to use an over-used adjective) seminal, not least because it contained within one book papers on the lexical approach, task-based learning, and ARC, and captured something of the excitement that infected (British) ELT in the mid-nineties. It doesn’t say so in the Introduction, but I seem to remember that most of the papers had originated as talks at an IATEFL Conference the year before. The shame is that publishers seem no longer committed to producing ‘state-of-the-art’ collections like this – and, as you say, it is now sadly out of print. ‘700 Classroom Activities’ by David Seymour and Maria Popova (Macmillan 2003/2005). An entirely practical book, with virtually none of the guidance on methodology offered by the lofty tomes mentioned above; it does exactly what it says on the tin. However, I think there is a kind of methodology and philosophy implicit in the range of activities contained: low-preparation, zero copying, eclectic, student-centred. I got myself a copy at a time when I was vaguely aware of DOGME and liked the sound of it, but lacked the experience/confidence to walk into a classroom empty-handed. With ‘700’ in my bag, I found I could throw away the crutches of coursebook and lesson plan and start to go where my students – and whatever unfolded in the classroom – took me. And after doing so many of these simple, communicative activities, I started to need the book less and less – I was at the stage where I could make up my own in a similar vein. But it’s still prominent on my shelf – dog-eared and highlighted, with a gaffer-taped spine. My wife, who is not a language teacher by trade, started giving Norwegian evening classes a couple of years ago; she is now a big fan of this book too. Without doubt the best fifteen pounds I’ve ever spent. Thanks, Danny. It’s nice to hear how a single book can function as a tool, or lever, for one’s own development. The point you make about being, initially, dependent on the book’s lesson structures, and then becoming increasingly independent, seems to be a good example of scaffolding operating at the level of teacher development: in sociocultural terms, the ‘ownership’ of increasingly more fluent routines represents a process of other-regulation leading to self-regulation, of appropriation leading to autonomy. As I have developed as a teacher, there has been a number of books that have helped me. In tandem with my development, I have become less dependent on textbooks. Actually, I feel textbooks can lead to teacher burnout. To stave off burnout, I have been developing materials that supplement a picture dictionary. Basically, teaching with only content-based material. Then I stumbled onto your blog here,Scott, and discovered your Dogme ELT methodology. I was totally blown away. I bought your book, Teaching Unplugged, and have been engrossed with it ever since. It makes total sense to me. Teaching Unplugged, came to me, freakishly perfect, at the right time in my development as a professional. I have been making A6 cards of the actvities in your book and can easily plan out a set of Dogme ELT activities smoothly. Since discovering Dogme ELT, I haven’t been using my picture dictionary materials. I can’t seem to be able to open any type of textbook lately. I wonder if I’ll ever be able to get back to designing my materials. Thanks Mark, and thanks “Mr Darkbloom” (earlier) for your kind words re Teaching Unplugged, and just to say that my co-author and friend, Luke Meddings, deserves just as much – if not more – credit than I do. I’ll pass your comments on. Thanks, once again. The more I read and write about ELT, the more I basically find myself mainly interested in the history of it. Since reading your articles on the BC/BBC site (TeachEnglish?) I get the impression that this is also an increasing interest of yours. Are you planning a book or series of articles on the topic? If not, can you recommend anything else I could read? I’ve read A History of English Language Teaching twice, and I find that there is too much of an emphasis on the distant past and too many holes (e.g. little mention of chains of schools or backpacking teachers) for me. If there happened to be an MA that focussed majorly (or even mainly or only) on the history of ELT, that would be one that I might actually finish this time! I’m not sure what they offer as part of their MA, but if I was ever to do a doctorate, I think I’d be beating a path to their door. I think Freire’s Pedagogy of the Oppressed probably had the biggest impact on me. At the time I read it, I was working in a job that saw work ease up for a few months of the year. I had one of those jobs where your colleagues don’t really understand what your role is so you can get away with blue murder. Every day for a week or two, my entire working day was spent trying to work my way through POTO. The book is now full of scribblings etc that I rarely read. Why so influential (after all, I have never taught anybody but society’s most privileged)? Well, I think it was Freire’s methodology in working with the peasants and the illiterate: visit, discover what is important for the students, retreat, prepare materials, allow Ss to discover alternative ways of looking at problems, demonstrate that the subject being studied has a practical use and can help you change your life, walk away from student-teacher dichotomies. A few months later, I discovered Dogme ELT. I think Freire had primed me for it…I shall be telling this with a sigh/Somewhere ages and ages hence. As far as EFL books go, it gives me no displeasure to admit that Thornbury, S. is the most influential writer for me. Without wishing to make you blush, the books are written in such an accessible style and yet have a very substantial feel to the content. You’ve got a real gift. Whereas I plough resolutely on with the other books, often having to spend far longer on them than I’d like (and, as I get older, that often means putting them aside unfinished), I find your books can even be read on the train coming home from work. Were I to try such a feat with any others, I would succumb to the Orphean lute. In a long conversation with Malraux, Mao Tse-Tung declared, “You know I’ve proclaimed for a long time: we must teach the masses clearly what we have received from them confusedly.”… This affirmation contains an entire dialogical theory of how to construct the program content of education, which cannot be elaborated according to what the educator thinks best for the students. I (deservedly) got a right bollocking. As for your (undeservedly) kind words, I am actually a little embarrassed – this thread hadn’t been intended as a Festschrift! But coming from someone whose writing style (not to mention its content) I have always admired, that is indeed a compliment of the first order. Just found this ‘S’ post a few minutes ago. I have already searched the library at college and have found the Stevick book there for the picking. First thing Monday I will be finding my favourite seat behind the philosophy section and hide myself in this book for a few days (between teaching classes). Thornbury, S (1996) ‘Teachers research teacher talk’. ELT Journal 50: 279-289. Reading van Lier’s book on classroom interaction (1996: Interaction in the Language Classroom: Awareness, Authenticity) was a major break though in my studies, I felt I had found theory which seemed to support my classroom practice. Reading Scott’s works and talking (both online and with friends) about dogme are living extensions of a wonderful thread of practice-focused theorists weaving classroom realities and context into theory. As I followed van Lier to The Ecology and Semiotics of Language Learning: A Sociocultural Perspective (2004) what has struck me most is that whichever book I am engaged with it is the people who I share the ideas and discussions with who make that book what it can be. There are lists and lists of teaching/theory books which have had a huge impact on me and have truly engaged me. I find the ones which stay with me are the ones recommended by people who engage me, give me more ideas everyone. I’m a big people person. It’s great fun to see Joanne’s mention of Scott’s article on Teacher Talk, not least because I was one of the Dip students at the time who took part! The idea of “barranking” follows me to this day (and I still haven’t tried it). How small the ELT world is! I too have yet to try ‘barranking’, but would love to one day. It was one of the first articles I read as part of the MA. I went on to base many of my module assignments on recorded teacher talk from colleagues. A great way to learn about your own working context and interaction in the classroom. We later found out that ‘barrancking’ is actually ‘canyoning’. Still none the wiser frankly! Like Ben, I found The Mind’s Eye very useful when I started teaching, partly because it gave us all respite from the structure-focused coursebook we were using – I still remember that picture of the shrouded couple kissing, wow. And like Alex and Scott, I am fascinated by the history of ELT. I’ve been trying to answer the question about a book that changed my life and coming up short – I loved an early LTP book that I think was called Out & About (anyone remember? – it had an orange cover and was full of idioms). But the ‘life-changer’ was probably not a book but a meeting with Louis Alexander, when I was working for the EL Gazette. 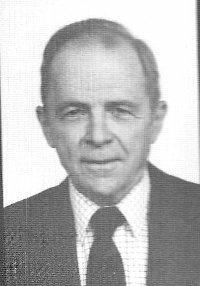 He described the genesis of New Concept English and his later projects with the Council of Europe and related his new CALL projects to very early televised teaching. Yes, a morning that changed my life and led me back into teaching rather than away into journalism. (He was sufficiently pleased with the published interview to encourage me to write more, and later showed a keen interest in dogme). That meeting was followed by fascinating encounters with (Lord) Randolph Quirk and John Trim. All of this helped me to see that ELT was not only a much bigger, richer field than I had realised, but had its own heritage and was part of other worlds. So one of the handful of books I ordered for a non-plussed staffroom when I helped to start a school at the end of the 1990s was First Things First! I didn’t expect colleagues to use it, I just wanted to have it there, partly for sentimental reasons, and partly to show that – as Scott says – life didn’t start with Headway. Thanks, Luke. Life didn’t start with Headway – but it almost ended there! There’s a good taped lecture by him uploaded there (under the ‘Archive’ tab) about the history of EFL and we’ve benefitted from great help from his widow Julia Alexander. Maybe Earl Stevick should be a contender for our Hall of Fame… Any other suggestions? I’m sure Scott will make it there one day himself but he’s too young as yet – I’d love to hear some suggestions for people of older generations, especially women! Thank you Richard. My vote for the Hall of Fame is Wilga Rivers: she was obligatory reading when I did my Diploma course in the early eighties (Teaching Foreign Language Skills 1968, 1981), but, more than that, she succeeded in bridging not only the audiolingual and the communicative paradigm shift, but (perhaps because she was Australian) the US – UK division that reigned at the time – and, arguably, still does. I was lucky enough to have met her at a conference in Barcelona in the late eighties. We had coffee together and I still remember her uncompromising Australian accent. She caused a minor stir at the conference by writing on an overhead projection screen with an indelible pen. She taught at Harvard for a long time, and it’s somewhat sad, but also endearing, that, since her death two or three years ago, her personal library has re-surfaced in second-hand bookshops in Boston. I am the proud owner of a number of books with her signature on the first page – including Stevick’s Images and Options, mentioned above. Thanks Scott – good suggestion! After several moves etc. “A Way and Ways” is the only book that I still have the original copy of from my MA course. It has made several transoceanic journeys and now sits on my shelf near my desk. I’ve turned to it now and again down the years. Great book that made me think back then and now. I found an old edition of Stevick’s A Way and Ways (a copy long retired from the library of a local university) in a thrift store back home. This was some months before I even left for my initial Trinity certificate course and ensuing first job. But I picked it up as I had already made all my plans to go when I found it and was eager to get started learning. I remember finding the book nearly impenetrable–all the talk of cuisenaire rods, the Silent Way, and ‘Suggestopedia’ seemed wholly foreign to me. After five years I finally went back home and found it tucked away in a plastic storage bin under my old bed. I brought it back with me and have it here on my desk as I write this. I’ve thumbed through the first bit a couple of times and hope to have time to revisit it more thoroughly, to read it all again through the window of these five years of teaching and learning about teaching. I’ve especially liked going back and re-reading his take on the Critical Self, Performing Self, and of all the masks we as teachers put on and take off at one time or another. If I had to mention books that really marked a turning point for me, in a purely practical sense for my teaching, I’d say Andrew Wright’s Pictures for Language Learning or 1000 Pictures for Teachers to Copy. I found them early on at a time when I was really struggling for ideas to wean myself from the teat of the coursebooks at hand. Scott, I suppose the seeds of Dogme ELT were planted by Stevick. Have you ever received any feedback from teachers regarding the suitability of Dogme ELT for exam courses? I think Dogme encourages the speaking skills learners need to acquire for the speaking part of the exams like FCE: turn-taking, back-channelling, or just getting the ´flying hours´ they need in order expressing their own meanings and discover gaps in their vocabulary. What’s your take on Dogme for standardised exam prep courses? Identify task types tested in the exam (such as describing a picture or writing a semi-formal letter) and find ways to practise these tasks using real-life contexts. If someone mentions a problem they are having outside class, you can brainstorm ways to approach this, and then draft a class letter which endeavours to resolve it. The key is to elicit, teach and practice the kind of structures that the exam will test in classroom tasks, but to retain the immediacy and engagement of real content. Just browsing through this old thread. I have to ask, are you still plugged into the magical ‘method’ for language teaching? Stevick fans should remember The Riddle of the Right Method, a timely warning that with something as complex and socially layered as human language, neat methods do little more than touch upon this or that area in the classroom. Language is eventually developed in the outside world of real commerce and interchange, and the process is a long one. No ‘magical methods’, no Riaz. More important than a ‘method’ is – in Stevick’s own words ‘what goes on inside and between the people in the classroom’ – and, as you point out, outside it too.